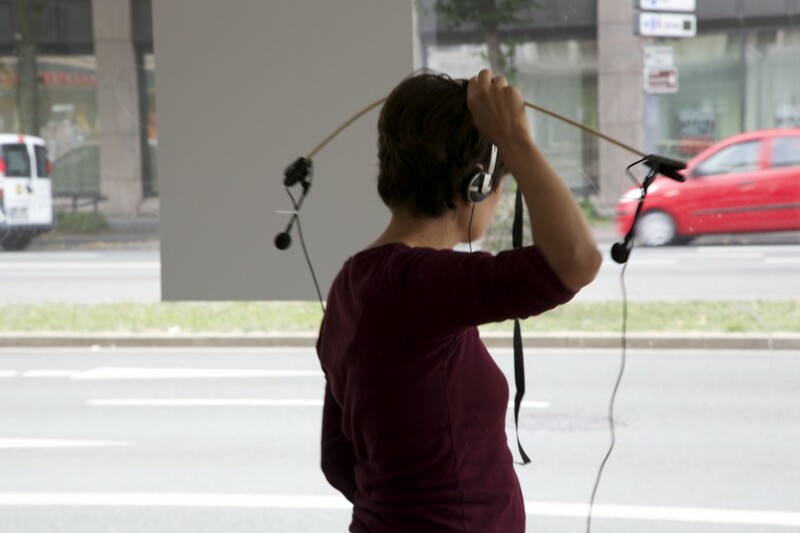 Extended Ears (2013) sound walks with listening horns and an iPhone app. developed during the research project sonozones, with Jan Schacher. This is the last piece that belongs to my research on microphones and loudspeakers as musical instruments. 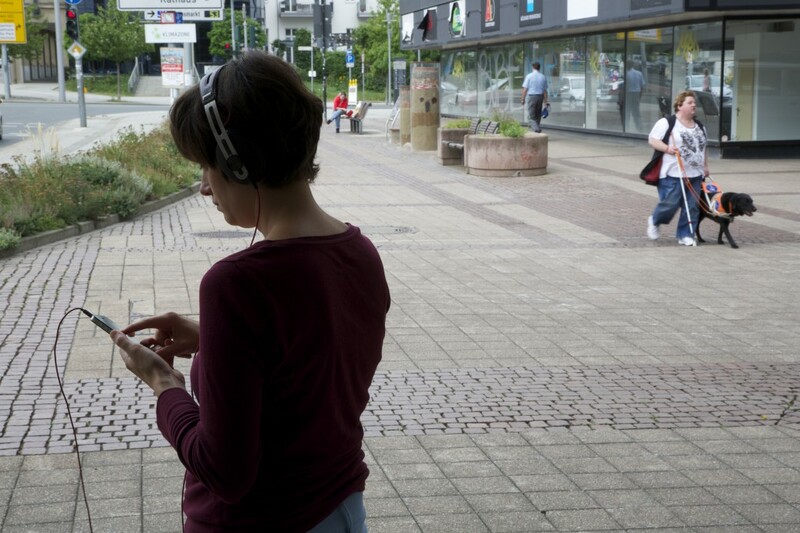 I was invited by Jan Schacher to take part in the research project sonozones, a project that focused on the sonic characteristics of the German city Mülheim an der Ruhr. I wanted to try out what kind of effect a simple transformation would have on the sounds of the city. I tried three different concepts, a “mechanical”, “electric”, and “virtual” transformation and walked through the city with them to discover its changes in soundscape. The soundscape of the city should be just slightly changed by the addition of a microphone and loudspeaker. The “electric” transformation just picks up the sounds through a microphone and plays them back through headphones, while walking through the city. 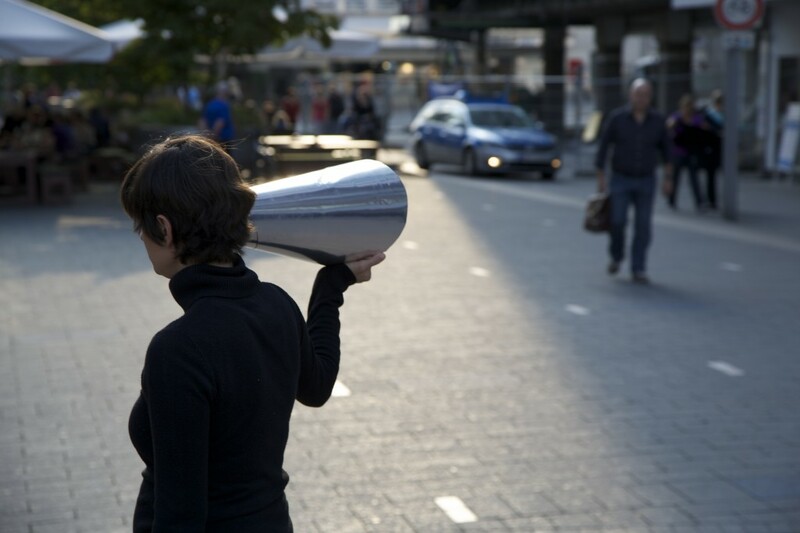 The soundscape of the city is slightly changed by the addition of a microphone and loudspeaker. Listening through microphones and headphones. The “virtual” transformation deliberately changes the soundscape. In the form of an iPhone App, the soundscape is picked up by the phone’s microphone, transformed with the use of live electronic processing (such as filtering and reverb), and heard through headphones. Listening to the App sonozones. The final presentation of this project will happen in Mülheim an der Ruhr on the 26th of October 2013.